Only a brief summary of 9-11 is presented here, as massive volumes of more in-depth material are available on the World Wide Web and in video and paper formats. Tuesday, 11 September 2001 was a cloudless, bright late summer day in the eastern United States. It was a week after Labor Day, the traditional end of the summer travel and vacation season, and the beginning of American football season, school and thoughts of autumn. The day was as routine as any in New York, New York and Washington, D.C. Before ordinary passenger jets became fiery menaces, people in the World Trade Center and Pentagon were working at personal computers, typing letters or reading e-mail, speaking on the phone or processing paperwork. None of the civilians seemed to know what was to happen. At 5:30 a.m., several men flew on a commuter jet from Portland, Maine, to Logan International Airport in Boston. They boarded two Boeing 767s, American Airlines (AAL) Flight 11, and United Airlines (UAL) Flight 175. Both jets were supposed to arrive in Los Angeles. According to investigations and eyewitnesses accounts later intercepted from the planes while in flight, these men carried small knives and box cutters, tools more often used for opening packages. Other men, similarly armed, traveled to Newark International Airport to take UAL Flight 93 at 8:42 a.m. to San Francisco, and Washington Dulles Airport to board AAL Flight 77 for 8:20 a.m. departure to Los Angeles. All of the jets were scheduled for transcontinental flights and carried an average of 20,000 gallons of aviation fuel. This was probably one of the major reasons they were selected, as the amount of fuel, plus impact into a building, added up to a lethal bomb. 8:42 a.m. -- AAL Flight 11 hits 1 World Trade Center, also known as the north tower and distinctive for its huge television antenna. 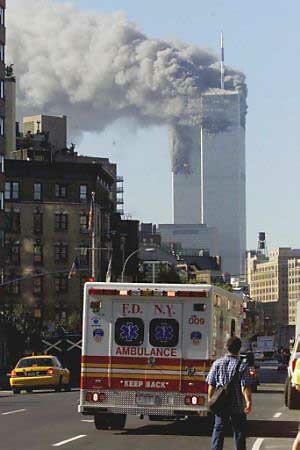 9:03 a.m. a.m. -- UAL Flight 175 strikes 2 World World Trade Center (south tower). 9:25 a.m. -- The Federal Aviation Administration orders a shutdown of all airports nationwide. 9:40 a.m. --AAL Flight 77 crashes into the west face of the Pentagon. 10:40 a.m. -- UAL Flight 93 crashes near Shanksville, Pennsylvania. Its crash is attributed in part to several passengers' decision to attack the hijackers. 5:20 p.m. -- WTC 7 collapses. It apparently was weakened by falling debris from the Twin Towers and the conbustion of large tanks of diesel fuel stored on the premises. 8:30 p.m. -- President George W. Bush addresses citizens in a televised Oval Office speech. Just over 3,000 were killed in the three attacks. Here is a breakdown. World Trade Center: Total, 2,830 people. Most of these victims were civilians on the WTC premises. This figure also includes 343 New York firefighters; 23 New York city police officers; 37 Port Authority police officers; 92 persons on AAL Flight 11; and 65 people on UAL Flight 175. A complex of seven buildings on 16 acres of land in Lower Manhattan, New York, New York, USA. The concept of a "world trade center" was discussed in NYC as early as the late 1940s. The World Trade Center was spearheaded beginning in the early 1960s by the Port Authority of New York and New Jersey, with staunch support from New York Governor Nelson Rockefeller, and his brother, David, head of the Chase Manhattan Bank. It was promoted as an urban renewal project. A 16-block area in Lower Manhattan was branded as "blighted" and selected as the site for the new skyscrapers. The area did contain a number of old buildings, some nearly a century old, but really was a fairly successful small business district. Its distinctive feature was "Radio Row," several streets of dealers in appliances and parts. Minoru Yamasaki, a quiet native of Washington state who worked in canneries to put himself through college, was selected as lead architect. He was widely quoted as saying: "The World Trade Center should, because of its importance, become a living representation of man's belief in humanity, his need for individual dignity, his belief in the cooperation of men, and through this cooperation his ability to find greatness." The towers featured a unique design in which closely spaced columns and horizontal floor trusses carried all of their weight. A central core housed the elevators. The design meant that there were no support pillars in any of the office suites. The WTC complex was set in the 5.2-acre Austin J. Tobin Plaza, named after the first director of the Port Authority. In the development's early days, it was compared to the Piazza San Marco in Venice, Italy. WTC 1: 1,368 feet; 110 stories. A restaurant occupied the top floor; Windows on the World was a pricey, well-regarded eatery. A TV antenna serving 10 area stations was erected in 1980. WTC 2: 1,362 feet; 110 stories. The enclosed public observation deck on the 107th floor opened at the end of 1974. The rooftop deck opened in 1976. On clear days, visitors could see in a 45-mile radius. Both structures had about 10 million square feet of rentable space. An estimated 45,000 people worked there, and an additional 90,000 visited daily. The WTC's tenants shifted from trading firms and boat lines in the 1970s to stock and bond and financial firms by 2001. WTC 3: The Marriott World Trade center hotel. The 22-story hotel originally was the Vista when Hilton opened it in 1981. It was destroyed by debris from the collapsing towers. WTC 4 and 5: The "Plaza Buildings" each had nine stories, with WTC 4 on the south and WTC 5 on the north. Both buildings were heavily damaged and were torn down in 2001-2002. WTC 6: The US Customs House; eight stories. Severely damaged in the attack and demolished by construction crews in 2001-2002. WTC 7: This 47-story structure had been developed and built by Larry Silverstein Properties in the latter half of the 1980s. Silverstein was manager of the entire WTC complex after he signed a 99-year lease with the Port Authority in summer 2001. In early 2002, news reports indicated Silverstein was to rebuild WTC 7, with completion by 2005 or 2006. The Mall at World Trade Center: A subterranean retail center with apparel, office supplies and food court. In contrast to suburban malls, it was open during work day hours and was closed on Sundays. 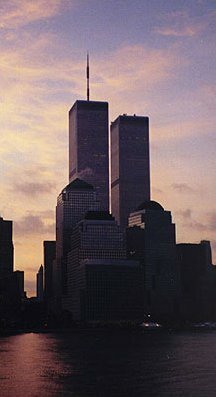 The Twin Towers survived an initial terrorist attack of a van bomb planted in the underground parking structure in February 1993. Seven people died. Headquarters of the United States Department of Defense in Washington, D.C. Construction of the five-sided structure was concluded in 1943 after 16 months of labor. It consists of five concentric pentagons of corridors and offices, with the designation of "rings," and labeled "A" through "E." These wedges are interconnected and enable employees to easily walk to other sections without ever going outside. The Pentagon is twice the size of Chicago's Merchandise Mart and houses 23,000 military and civilian workers. Numbers: 3.7 million square feet of office space; 200 acres of lawn; 8,770 cars parked in 16 parking lots; 131 stairways and 19 escalators; one dining room, six snack bars and one outside snack bar; 4,200 clocks; and 691 drinking fountains and 284 restrooms. The original Pentagon site was swamps and marshlands. About 5.5 million cubic feet and 41,492 concrete piles were placed for the foundation. The forms on which the office rings sit were from 680,000 tons of sand and gravel from the nearby Potomac River were processed into 450,000 tons of concrete. When the Pentagon was completed, it consolidated operations of the then-named War Department from 17 buildings to just one. The Pentagon damage area was razed after the crash of United Airlines Flight 77. The Defense Department began an ambitious $700 million reconstruction plan with the goal of reopening and rededication on 11 September 2002, the one-year anniversary of the terrorist attacks. Rural township in Somerset Country, southwest Pennsylvania, with population of 245. Shanksville is 129 miles from Washington, D.C. Flight 93 crashed in the township. It is an area of dairy farms and a large man-made body of water called Indian Lake. The Amish are a familiar sight, and the coal mining industry is represented. Based on cellular phone calls from Flight 93, three passengers, Jeremy Glick, Todd Beamer and Thomas Burnett, decided to attack the hijackers. Beamer's reported last words before the uprising: "Are you guys ready? Let's roll!" Resident Donna Glesser said of her town in Public Opinion online: "Our area was settled just after the Revolutionary War, mainly by German farm families emigrating from Eastern Pennsylvania. The town of Shanksville itself dates to 1798 when its founder, Christian Shank, came here to build a mill on the Stonycreek River. Slowly a town grew around the mill until there was a blacksmith shop, several general stores, churches, a school, and even a hotel. "Shanksville had high hopes at one time of becoming a "metropolis" with its own rail station. But, plans changed and maps were re-drawn and, for good or for ill, growth and rapid change bypassed Shanksville." The 19 men who hijacked the four jets on 11 September were believed to be members of al-Qaeda, Arabic for "The Base." Al-Qaeda is a loose confederation of terrorist cells based in an estimated 60 nations across North America, Africa, Asia and Europe. The leader has been identified as Osama Bin Laden, who established the network's headquarters in Khartoum, Sudan, in 1991. Al-Qaeda had moved to Afghanistan in the 1990s under the protection of the Taliban, a very conservative Islamic sect that ruled the country from 1996-2001. Al-Qaeda is supposed to have trained men in a variety of warrior skils, from weapons handling and combat to successfully blending into western cultures. The United States was touted as the biggest enemy to Islam because of its imperialistic policies that oppress Muslims, presence of its troops by Islamic holy places, and for its support of Israel. They support expulsion of all non-Muslims from Islamic countries. Al-Qaeda is blamed for the 1996 bombing of the Khobar Towers in Riyadh, Saudi Arabia, killing numerous US military personnel; the 1998 bombings of American embassies in Kenya and Tanzania; and the 2000 suicide boat attack on the USS Cole in a port stop at Yemen. The leader of al-Qaeda is identified as bin Laden, born 1957 to Mohammed Awad bin Laden, a close friend of the Saudi royal family and prosperous founder of the Saudi Bin Laden Group, a construction firm. The elder Bin Laden had emigrated to Saudi Arabia from Yemen in 1930 and worked his way up from porter to billionaire contractor. Bin Laden grew up with numerous brothers and sisters, in a life that was luxurious but ruled by strict values. He studied business and economics at Abdul Al-Aziz University in Jedda, Saudi Arabia. In late 1979, he created Maktab al-Khidimat, a group that imported arms and trained personnel to fight the occupying Soviet forces in Afghanistan. He was believed to be worth $300 million and put much of it toward his causes. During the Soviet occupation through 1989, Bin Laden received training and support from the US Central Intelligence Agency. Bin Laden returned to Saudi Arabia in 1991 to work for the Bin Laden Group, but was expelled for anti-government sentiments. His Saudi citizenship was stripped and all assets in the country were frozen by 1994. 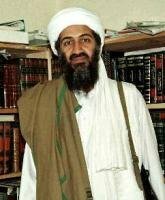 Bin Laden opposed the presence of US bases and military in his homeland and near Islam's holy cities of Mecca and Medina. His whereabouts are currently unknown. Who is Osama Bin Laden? A scholarly analysis from a non-American point of view. Another non-American Who is Osama Bin Laden? from the British Broadcasting Corp.
From information compiled by the US Federal Bureau of Investigation and represents "official" information. Satam M.A. Al Suqami -- Possible Saudi national. Dates of birth used: June 28, 1976; Last known address: United Arab Emirates. Waleed M. Alshehri -- Possible Saudi national. Dates of birth used: September 13, 1974; January 1, 1976; March 3, 1976; July 8, 1977; December 20, 1978; May 11, 1979; November 5, 1979. Possible residence(s): Hollywood, Florida; Orlando, Florida; Daytona Beach, Florida. Believed to be a pilot. Wail M. Alshehri -- Date of birth used: September 1, 1968. Possible residence(s): Hollywood, Florida; Newton, Massachusetts. Believed to be a pilot. Mohamed Atta -- Possible Egyptian national. Date of birth used: September 1, 1968. Possible residence(s): Hollywood, Florida; Coral Springs, Florida; Hamburg, Germany. Believed to be a pilot. Aliases: Mehan Atta; Mohammad El Amir; Muhammad Atta; Mohamed El Sayed; Mohamed Elsayed; Muhammad Muhammad Al Amir Awag Al Sayyid Atta; Muhammad Muhammad Al-Amir Awad Al Sayad. Abdulaziz Alomari -- Possible Saudi national. Dates of birth used: December 24, 1972 and May 28, 1979. Possible residence(s): Hollywood, Florida. Believed to be a pilot. Marwan Al-Shehhi -- Date of birth used: May 9, 1978. Possible residence(s): Hollywood, Florida. Believed to be a pilot. Aliases: Marwan Yusif Muhammad Rashid Al-Shehi; Marwan Yusif Muhammad Rashid Lakrab Al-Shihhi; Abu Abdullah. Hamza Alghamdi -- Possible residence(s): Delray Beach, Florida. Aliases: Hamza Al-Ghamdi; Hamza Ghamdi; Hamzah Alghamdi; Hamza Alghamdi Saleh. Mohand Alshehri -- Possible residence(s): Delray Beach, Florida. Aliases: Mohammed Alshehhi; Mohamd Alshehri; Mohald Alshehri. Saeed Alghamdi -- Possible residence: Delray Beach, Florida. Aliases: Abdul Rahman Saed Alghamdi; Ali S Alghamdi; Al- Gamdi; Saad M.S. Al Ghamdi; Sadda Al Ghamdi; Saheed Al-Ghamdi; Seed Al Ghamdi. Ahmed Ibrahim A. Al Haznawi -- Possible Saudi national. Date of birth used: October 11, 1980. Possible residence: Delray Beach, Florida. Alias: Ahmed Alhaznawi. Ahmed Alnami -- Possible residence: Delray Beach, Florida. Aliases: Ali Ahmed Alnami; Ahmed A. Al-Nami; Ahmed Al- Nawi. Ziad Samir Jarrah -- May have been Lebanese national. Believed to be a pilot. Aliases: Zaid Jarrahi; Zaid Samr Jarrah; Ziad S. Jarrah; Ziad Jarrah Jarrat, Ziad Samir Jarrahi. Khalid Almihdhar -- Possible Saudi national. Possible resident of San Diego, California, and New York Aliases: Sannan Al-Makki; Khalid Bin Muhammad; 'Addallah Al-Mihdhar; Khalid Mohammad Al-Saqaf. Majed Moqed -- Possible Saudi national. Aliases: Majed M.GH Moqed; Majed Moqed, Majed Mashaan Moqed. Salem Alhazmi -- Possible Saudi national. Possible resident of Fort Lee, New Jersey; Wayne, New Jersey. Hani Hanjour -- Possible resident of Phoenix, Arizona, and San Diego, California. Aliases: Hani Saleh Hanjour; Hani Saleh; Hani Hanjour, Hani Saleh H. Hanjour.